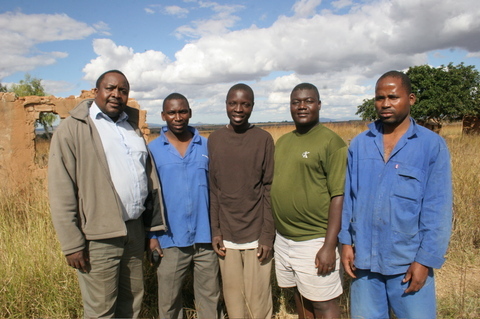 Our team for upgrading my home from National Solar and Power from left to right: Alfred Maele, Steven Machilika, me, Elias Lazaro, and Ben Salala. 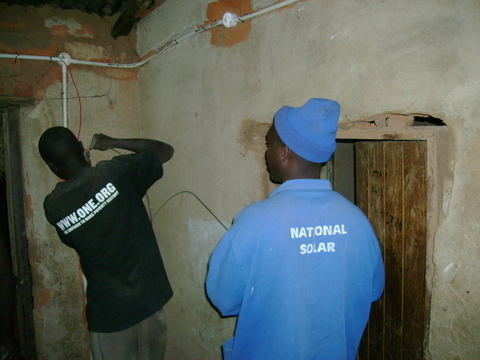 On Sunday, my friends from National Solar and I completed the next phase of work on my electrical system. You can see a compete set of (my first) digital photos at my new site on Flickr. 3. Increase the brightness of the lighting (lumens) to make it easier for my family to accomplish tasks at night, especially to read. c. 2 outside over each entrance to my family's home. 5. Install modern light switches and power outlets. 6. 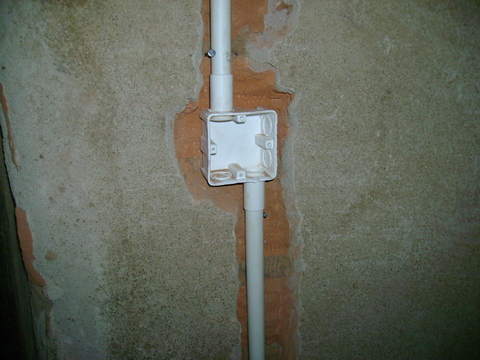 Hide the conduit as much as possible in the walls. 7. Provide AC power for small appliances in my bedroom and the living room through my new inverter, which converts the 12V DC power into 240 V household current. 8. Provide DC power for DC appliances and lighting. 10. Prepare for a hybrid wind/solar system in the future. 11. Install a lightning rod on the windmill. 12. Upgrade the wiring throughout the home from 1.5 mm to 4 mm, which can carry a lot more power safely. 1. First we planned the locations of all the new lights, switches and power outlets. 2. 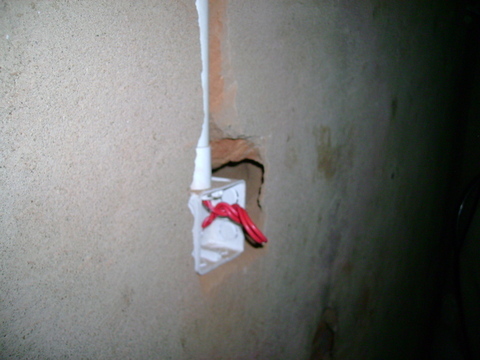 Then, we installed conduit and lighting, switch and outlet boxes throughout the house. 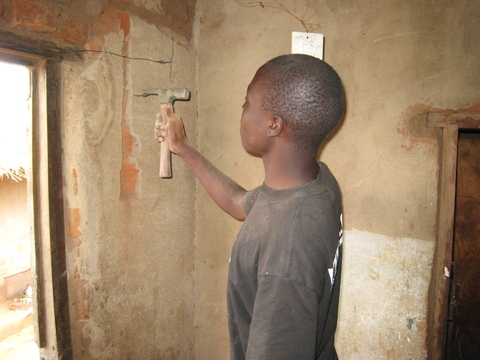 Where the wall was hard enough, we dug trenches in the walls to bury the conduit using a hammer and chisel. Digging out the wall with a chisel. The dual light switch for the outside and corridor lights will go here. Preparing to attach the switchbox to the conduit. 3. We also installed conduit from the top of the windmill to the bottom to replace the wire that ran directly from the windmill diagonally through the air down to my room. a. one from the windmill to my bedroom, where the power system is located. 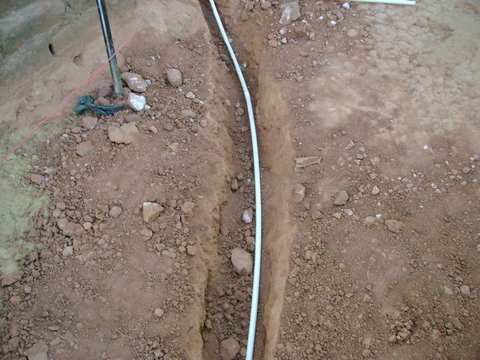 We dug a trench to run wires between the building containing my bedroom and my parents' main house. 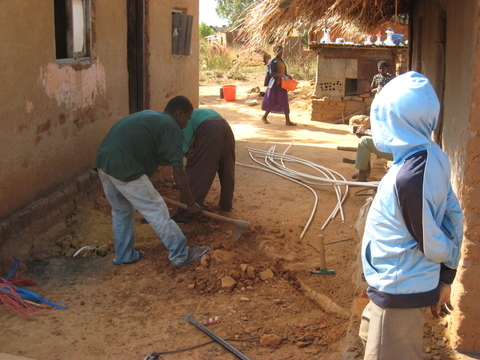 Elias threads wire that will run from the windmill to the house while my dad looks on in the background. 5. Next, we ran 4 mm copper wire through the conduits. We used a "fishing tip" to thread wires through the conduits. 6. Then we started installing the compact flourescent bulb fixtures and switches and power outlets. 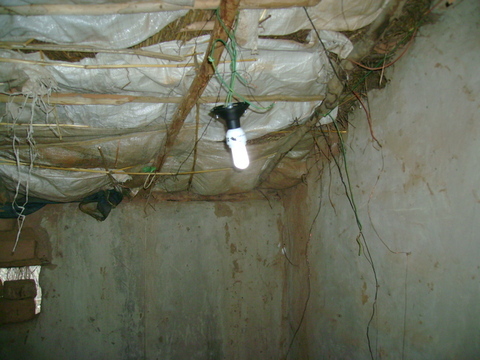 After installing the fixtures, we added the bulbs, 6 watts in most places and 9 watts in the living room and outside. The new light fixture with the much brighter compact flourescent bulb. Note that the wall has already been patched. This week I'm fixing some other wall issues before coating the walls with white lime, which will reflect the light, making it appear even brighter. 7. Then, we tested if all the wiring, and fixtures worked correctly. Everything operated correctly the first time. Even after installing the new system, I decided to leave my old, hand-built system of lights and switches so that people could see where I started. It will still work just fine, powered by the older car battery. My from scratch two light switch is at the left of the frame. The new switch is outside the picture. 8. We replaced the old battery with two new deep cycle batteries. 9. With these batteries, it's necessary to install a charge controller to make sure that the batteries are not overcharged or drained down too far. The controller automatically senses both of these conditions and either cuts off the power coming from the windmill in the first case, or it turns off the power to the house in the second case. Still, we now will have plenty of power every night. 10. We installed and tested a 600 watt inverter, which produced regular Malawian household current (240v) for powering a few small appliances. Paolo, trowel in hand, with my mother Agnes. My cousin Paolo helps patch the walls around the fixtures. This one is in the kitchen. You can tell because the walls are blackened from the cooking fires. The smoke is why the kitchen is in a separate building from the main house. My friend talked to me about chimneys. I'm thinking about that now. 12. We rewired the windmill's power circuitry. The old way I had it was that the windmill turned a pulley, which turned a bicycle wheel, which powered a small dynamo. I had used a step up transformer to convert this direct current to A/C 240 v to travel down the wire to my house, where I used a step-down transformer to convert it back to DC. We changed this to a direct DC power path from the windmill to the new battery system. This will enable us to add solar panels someday. 13. We showed my family how everything works. We worked very hard for three days. I learned a lot from working with the team from National Solar. They showed me how to do every step of the process that I didn't already know how to do, so that I would learn as much as possible. I would like to thank Alfred Maele, the owner of the company and the team who worked with me: Elias Lazaro, Ben Salala, and Steven Machilika.You can reach Alfred of National Solar at natsolar@malawi.net or 265 01 527 877. 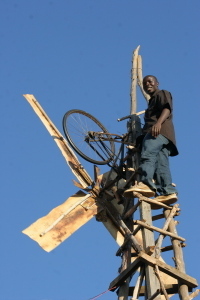 My 23 year old cousin, Geoffrey Kamkwamba assisted me with rewiring the windmill. Upgrading the windmill power system in my home. On Wednesday I visited a Solar and Wind Power dealer in the commercial trading area of Lilongwe, the capital city of Malawi, about 2 and 1/2 hours south of my home. I was looking for deep discharge batteries to replace the car battery I've been using to store power generated by the windmill. I learned about these batteries for the first time when visiting Mike McKay and his colleague Peter at Baobab Health. Hamant, the owner told me that they were currently out of stock but expecting a shipment any day, probably Friday or Saturday, as they had landed in Malawi from South Africa and were waiting to be released by customs. 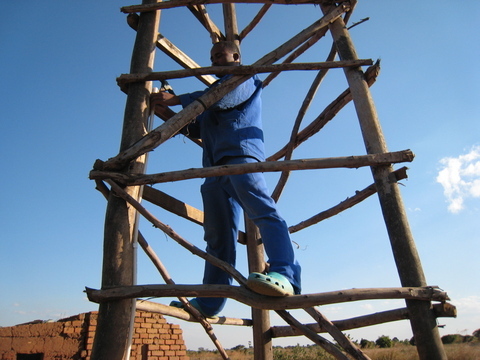 Shipping things into Malawi can be challenging. I tell Hamant that I would like to order one or two and my friend Tom and I start to tell him my story. He responds very enthusiastically and we start having a conversation about powering homes with DC power via wind or solar systems. It turns out he is quite an expert and very experienced. 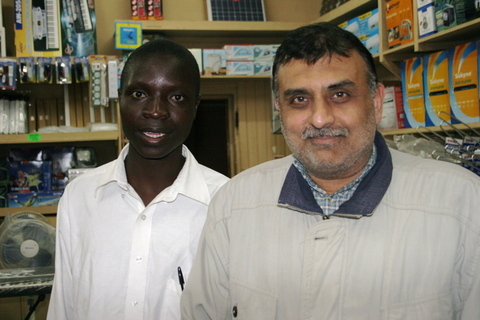 He works with all the big international NGO's to help them with their wind and solar power needs. He shows us these small compact fluorescent light bulbs that emit far more lumens than the lights I'm currently using at my home at the about the same low wattage. I decide to get eight bulbs and eight fixtures to install at my house. While I'm showing Hamant some pictures of the windmills, two guys who turn out to be local solar installers start to listen and join in the conversation. 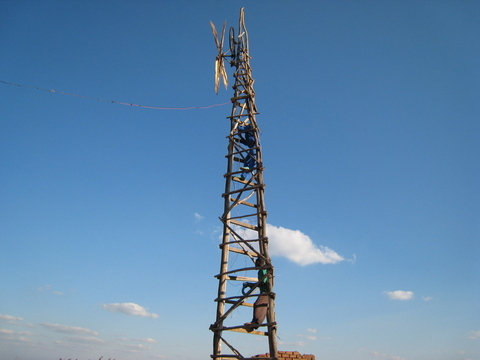 They are Elias and Steve from National Solar and Power Systems, and even though they are based in Zomba, 5 1/2 hours from my home, they turn out to be working in Kasungu province near my home. They ask if they can visit tomorrow Thursday in the afternoon. I say they are welcome. The next afternoon Elias and Steve wait patiently for us, even after we are delayed for an hour, and come to my farm. Tom goes to talk to my father to give him an update about how things are progressing on the school front and I take Elias and Steve into my room and show them my setup. I give them the tour of the house and we start talking. We decide to rewire my home with 10 lights, 7 in each room, one in the main corridor, and two porch bulbs. We'll put in new conduit and switches and wiring to be able to handle additional power should we add windmills or solar panels in the future. We work out a fair price and our friends help to finance the investment. We will start work Friday morning at 10 am. Tom has to go to Zomba to see Dr. Mchazime. 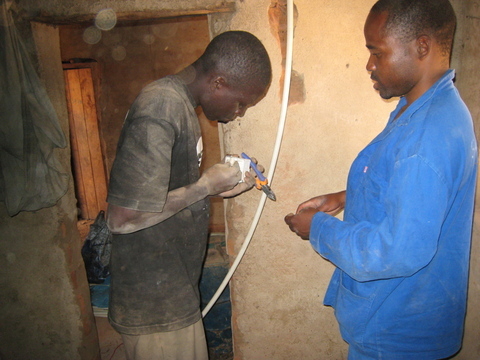 I will work side by side with Elias and Steve to help and to learn everything I can about modern electrical wiring. In the photo, I couldn't wait to try one of the new lights, so I installed one in my room on Thursday night. Now I can read much more easily. I am reading English Grammar, a textbook assigned to me by one of my teachers. We work all day Friday and dig trenches from the windmill to my room and then another one to cross the courtyard to the other building where my parents and sisters live. 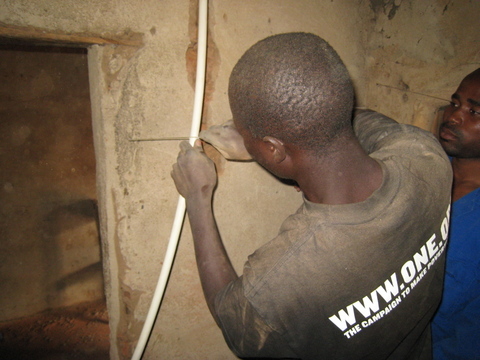 We install conduit in or on the walls depending on how hard or soft the walls are. At the end of the day I am very excited. On Saturday we will install the switches and fixtures. 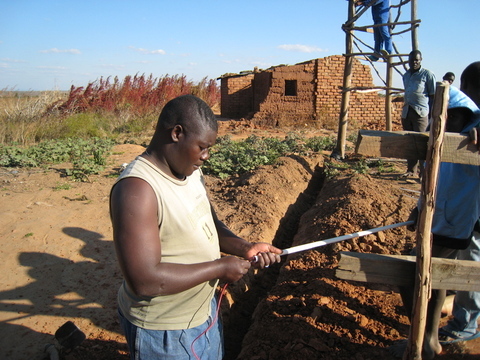 One of the workmen from National Solar and I work on pulling wires in the new conduit. I got the One.org T-Shirt at TEDGlobal in Arusha, Tanzania. 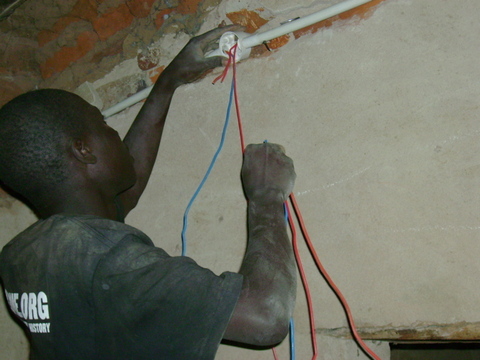 Today, Saturday, we installed the bulbs and switches and plastered over all the conduit and filled in the trenches. Tomorrow, we install the new batteries and charge controller, and Tom and Edson & Oliver from Boabab will come to see our handiwork. I'm excited to show them. Meanwhile, I'm reading English Grammar at night. I like it. The deep discharge batteries I have been waiting for since Tuesday arrived today at Solair, the solar and wind power dealer in Lilongwe that has been so helpful. Solair's proprietor, Hamant, who has been incredibly helpful, with me. Elias, my friend from National Solar and Power Systems is driving them up to me today, and we will install them first thing in the morning. We have two batteries plus a charge regulator to make sure the batteries aren't overcharged or over-discharged. These will provide a much longer reserve of power than the car battery I've used up until now. 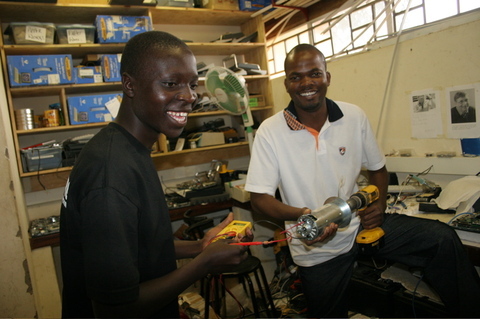 I learned about these batteries on last Sunday from Mike McKay and Soyapi Mumba at Baobab Health, where they use them to power their Touch Screen Patient Registration Systems, and their Touch Screen Anti-Retroviral Therapy Systems which allow non-doctors to correctly prescribe ART therapy for HIV patients in Malawi. With 1,000,000 people of the 13.5 million people in Malawi infected with HIV, these systems are essential in a country with only 165 M.D. doctors. 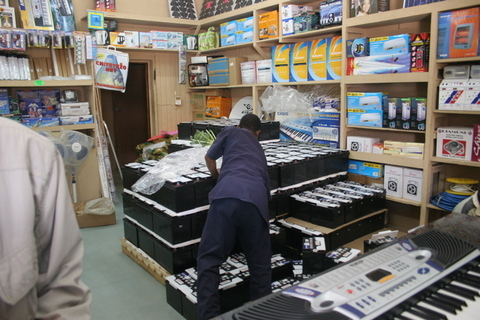 Their driver, Edson, took us to the shop to try to find these batteries and so many great things happened as a result. From November, 2006: The first newspaper article. 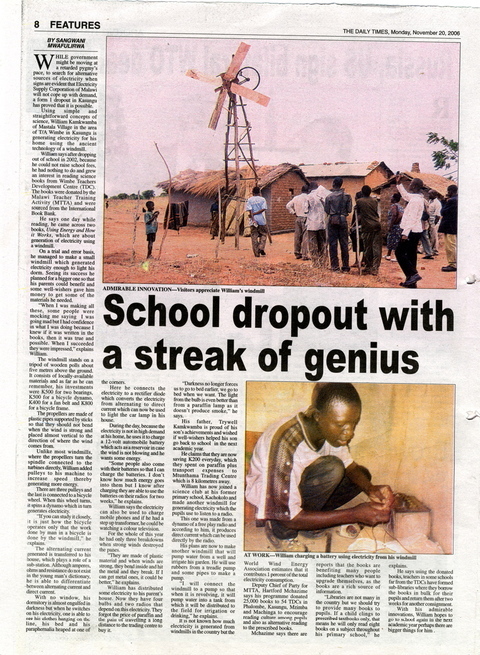 Here is the first article from the Malawi's The Daily Times, November 20, 2006. Sangwani has now left the Daily Times to work at a media NGO that promotes freedom of the press called Media Institute of Southern Africa or MISA. 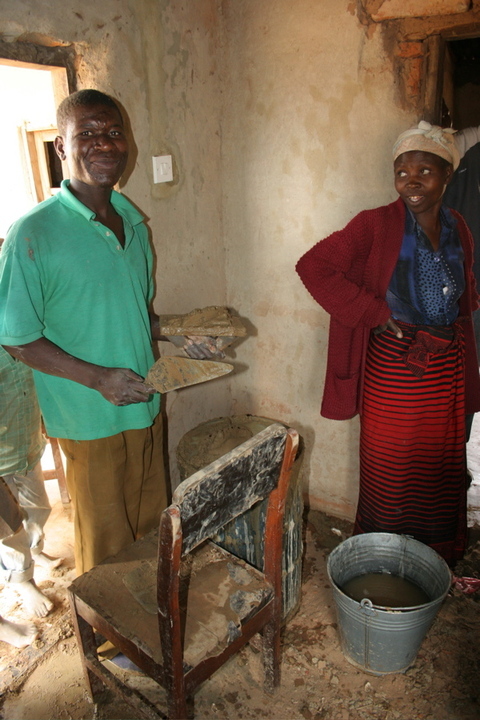 While government might be moving at a retarded pygmy’s pace to search for alternative sources of electricity when signs are evident that Escom will not cope up with increasing demand, a form 1 dropout in Kasungu has proved that it is possible. 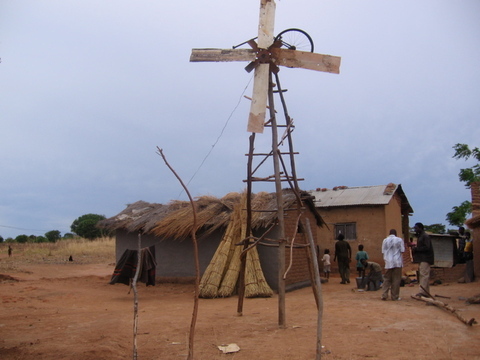 Using simple and straightforward concepts of science, William Kamkwamba of Mastala Village in the area of T/A Wimbe is generating electricity for his home using the ancient technology of a windmill. William says after dropping out of school in 2002, because he could not raise schools fees, he had nothing to do and grew an interest in reading science books from Wimbe Teachers Development Centre (TDC). 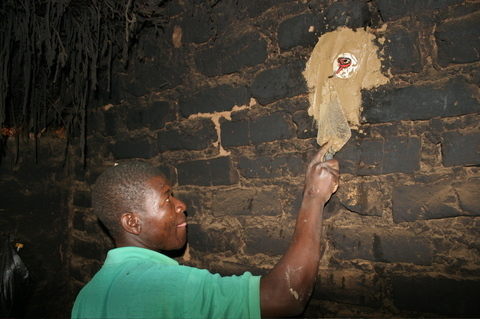 The books were donated by the Malawi Teacher Training Activity (MTTA) and were sourced from the International Book Bank. 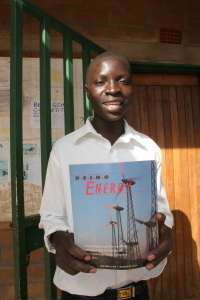 He says one day while reading he came across two books, “Using Energy” and “How it Works” which talked about how to generate electricity using a windmill and was motivated to try it. On a trial and error basis he managed to make a small windmill which generated electricity enough to light his little dom. Seeing its success he planned to make a bigger one so that his parents too could benefit and some well-wishers gave him money to get some of the materials he needed based on his innovativeness. “When I was making all these people were mocking me that I was driving mad but I had confidence in what I was doing because I knew if it was written in the books then it was true and possible. When I succeeded they were impressed,” explains William. 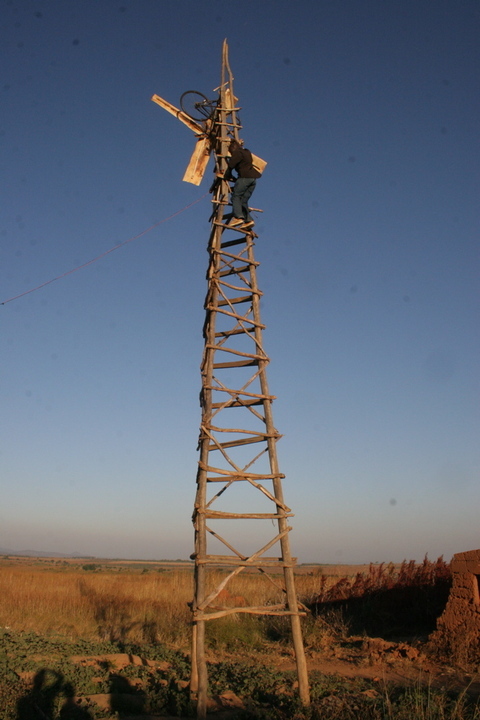 The windmill stands on a tripod of wood polls about five metres above the ground. It consists of locally-available materials and as far as he can remember his investments were K500 for two bearings, K500 for a bicycle dynamo, K400 for a fun belt and K800 for a bicycle frame. Back in November, the windmill was only 5 meters (15 feet) tall compared to 12 meters (36 feet) today. I raised the height because I discovered that the best wind was just over the top of the shorter windmill. The windmill today. I moved the location away from the house to avoid damage in case of mishap. 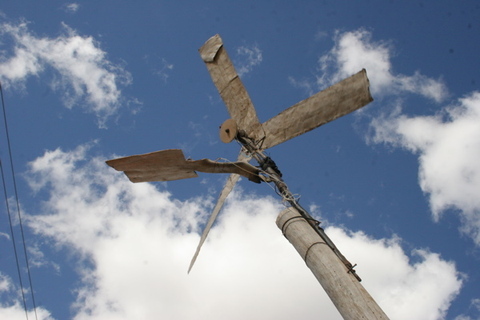 The propellers are made of plastic pipes supported by sticks to that they should not bend when the wind is strong and placed almost vertical to the direction the winds is coming. 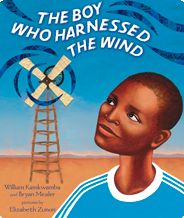 Unlike in most windmills where the propellers directly turn the spindle connected to the turbines directly, William added pulleys to his machine to increase speed thereby generating more energy. There are three pulleys and the last is connected to a bicycle wheel. When this wheel turns it turns a dynamo which in turn generates electricity. “If you can study is closely it is just as how the bicycle operates only than the work done by man in a bicycle here it is done by the windmill,” he explains. The alternating current generated is transferred to his house, which plays a role of a substation. Although amperes, ohms and resistance do not exist in the young man’s dictionary, he is able to differentiate between alternating current and direct current. With no window, his dormitory is almost engulfed in darkness but when he switches on his electricity, one is able to see his clothes hanging on the line, his bed and his paraphernalia heaped at one of the corners. 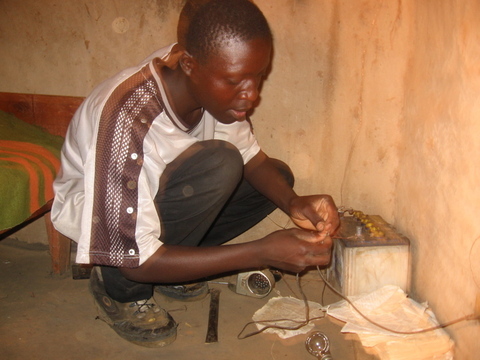 Here he connects the electricity to a rectifier diode which converts the electricity from alternating to direct current which can now be used to light the car lamp in his house. During day time because the electricity is not in high demand at his home he uses it to charge a 12-volt automobile battery which acts as a reservoir in case the wind is not blowing and he wants some energy. “Some people also come with their batteries so that I can charge them. I don’t know much energy goes into them but I know after charging they are able to use their battery listening to the radio for two weeks,” he explains. William says the electricity can also be used to charge mobile phones and if he could have a step up transformer he could be able to watch a colour television. For the whole of this year he had only three breakdowns because strong winds destroyed the panes. “They are made of plastic and when winds are strong they bend inside and hit the metal breaking in the process. If I can get metal ones it could be better,” he explains. As the speed of the dynamo increases, so is the rate of alternating current. This is good as it is stored in the battery that is being charged and is used at night or anytime when there are winds. 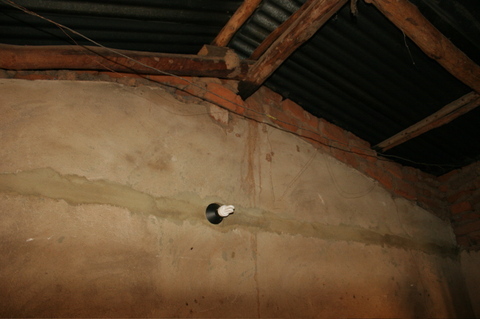 William has distributed some electricity to his parent’s house. Now they have four bulbs and two radios that depend on this electricity. They forgot the price of paraffin and the pain of riding a long distance to the trading centre to buy it. “Now we don’t sleep because of darkness but we go to bed when we want. 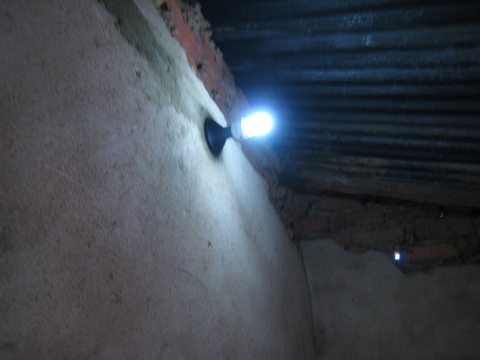 The light from the bulb is even better than from a paraffin lamp as it doesn’t produce smoke,” he says. 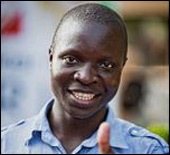 His father, Trywell Kamkwamba is all proud of his son’s achievements and wished if well-wishers could help him go back to school again next academic year. He claims that they are saving K200 and some transport money which they were using to buy paraffin from the Mtunthama Trading centre which is 8kms away. 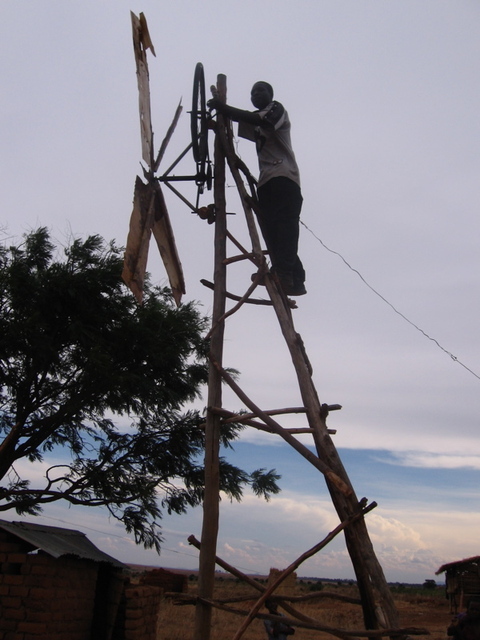 William has now joined a Science Club at his former primary school, Kachokolo and made another windmill for generating electricity which the pupils use to listen to a radio. This one was made from a dynamo of a free play radio and according to him it produces direct current which can be used directly by the radio. 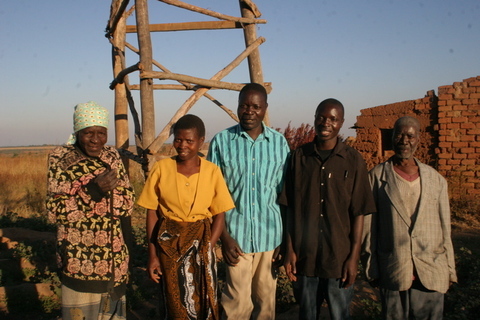 His plans are now to make another windmill that will pump water from a well and irrigate his garden. This will be done by using rubbers from a treadle pump and some pipes to make a pump. 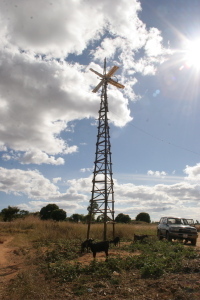 “I will connect the windmill to a pump so that when it is revolving it will be turning the pumping water into a tank from which it will be distributed to the field for irrigation or drinking,” he explained. It is not known how much electricity is generated from windmills in the country but the World Wind Energy Association estimates that it contributes 1 percent of the total electricity consumption. Deputy Chief of Party for MTTA, Hartford Mchazime says his programme donated 25,000 books to 54 TDCs in Phalombe, Kasungu, Mzimba and Machinga to encourage reading culture among pupils and also as alternative reading to the prescribed books. Mchazime says there are reports that the books are benefiting many people including teachers who want to upgrade themselves as the book are proving to be a rich source of information. “Libraries are a scarce commodity in the country but we should try to expose pupils to as many books as possible. If a child clings to prescribed textbooks only, that means he will only read eight books on a subject throughout his primary school,” he explains. He says using the donated books teachers in some schools far from the TDCs have formed sub-libraries where they borrow the books in bulk for their pupils and return after two weeks for another consignment. In his free time, William also does minor repair to people from his area and hopes if he finds money might return back to school next academic year. On Saturday I visited a Malawian NGO called Baobab Health. 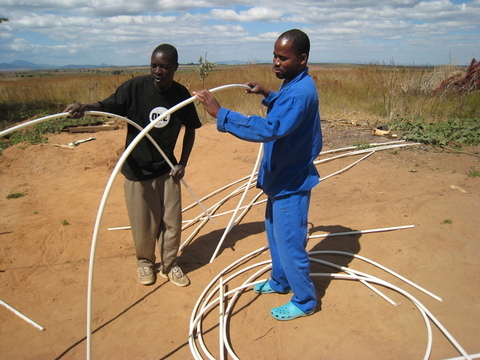 They work to automate the process of caring for patients in the Malawian health care system. My friends Mike, Peter and Soyapi work there. Here, Peter is showing me a stronger motor from a treadmill that I could drive with my windmill. It outputs 48V, 4x the power of my current windmill. 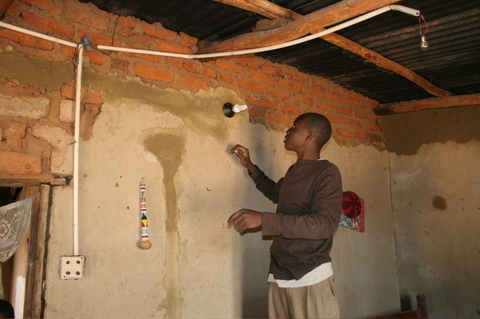 He demonstrates the output using an electric drill to turn the motor. I measure the power with a voltmeter. It's the first time I have used a voltmeter and I think it is very cool. Mike and Peter gave me the motor and the voltmeter as a gift. I am very happy. 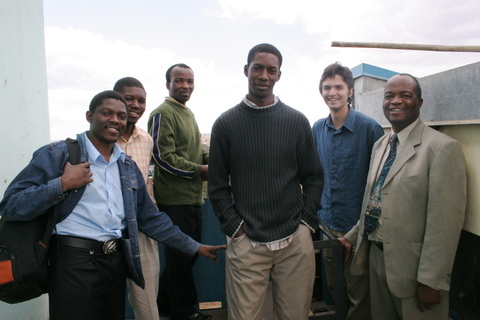 Soyapi Mumba, Oliver Gadabu, Alex Gondwe, Mwatha Bwanali, Mike McKay of Baobab Health and my mentor Dr. Hartford Mchazime, Ph.D. 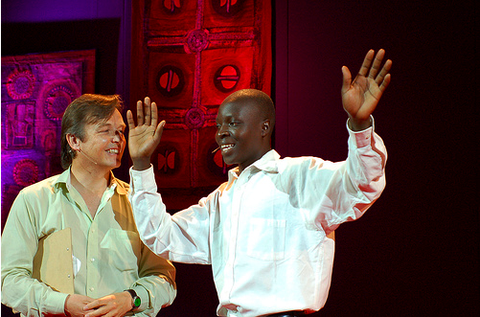 I was invited to attend the TEDGlobal conference June 4-7, 2007 in Arusha, Tanzania as one of 100 fellows by Emeka Okafor, a prominent Nigerian blogger (The Timbuktu Chronicles) and program director of the conference. He had blogged about my story back in December. He heard about the story after reading Mike McKay's post on his blog Hactivate. 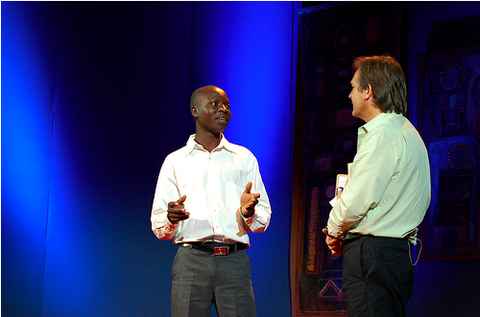 When it came time to produce the conference, Emeka put the word out and people applied for the 100 positions. Emeka worked very hard to find me. First he emailed and called the Daily News in Malawi, and tracked down the journalist who then connected him to my mentor Dr. Mchazime at the MTTA in Zomba, Malawi, 5 1/2 hours from my home. Dr. Mchazime worked with Emeka to get me to the conference, helping me get a passport, permission to attend from the Ministry of Education, and coaching me on what to expect on my journey. This was my first trip outside Malawi, my first airplane trip, and only my third time in a hotel, the others being the time I visited Dr. Mchazime in Zomba and the night before I left for Arusha. It was a huge adventure for me. I remember I was smiling the entire plane ride. 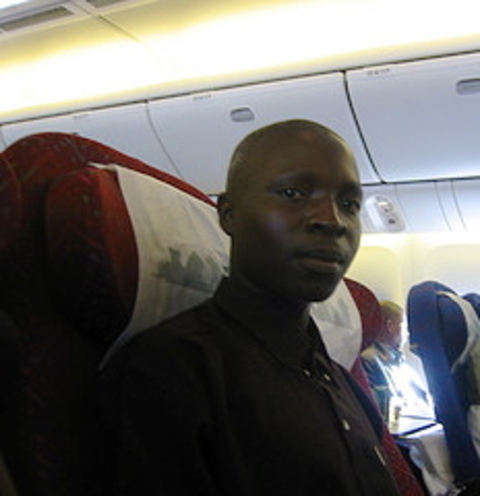 Fortunately, there was another fellow from Malawi on the plane with me named Soyapi Mumba. He was very kind to me during the conference and even helped interpret for me when I needed to understand or convey something despite limitations in my English. While I was there, the TED staff looked after me and made sure to introduce me to a lot of very interesting people. The team even asked me if Chris Anderson, the conference curator could interview me on stage. They asked me if I had a computer. I said, "No, I don't have." Then I unbuttoned the top button of my shirt. The TED staff person gave me a quizzical look. I pulled out a USB jump drive with a PowerPoint presentation that one of Dr. Mchazime's staff had helped me prepare before the conference. In the presentation I discussed my background, the windmill project, the challenges, how I overcame them, and my plans for the future. Because the presentation was too long to give on stage, we showed only the photos of the windmill and my family while Chris interviewed me on stage for about three minutes. The audience gave me a very positive response. I was very happy. Here is my family at home on our farm.